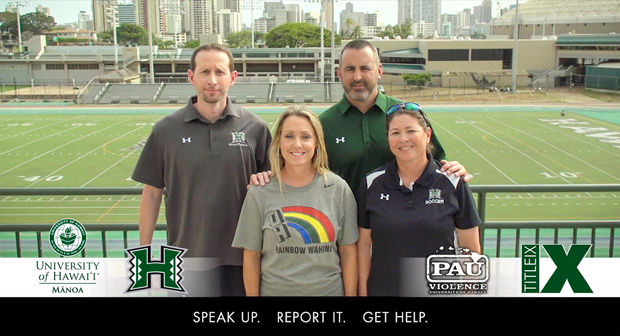 The University of Hawaiʻ Mānoa Athletics Department announces the debut of “Speak Up,” a 30-second public service announcement (PSA) addressing the issue of violence. Four of the university’s head coaches—Laura Beeman, women’s basketball; Eran Ganot, men’s basketball; Michele Nagamine, women’s soccer; and Nick Rolovich, football—are featured in the PSA produced by Oceanic Time Warner Cable. The overarching message of the PSA is that violence of any kind is not acceptable and that everyone needs to work together to create a safe community. UH Mānoa athletics views the issue of domestic and campus violence as a top priority. At the recent “Ladies Night” event with the UH football team, a representative from the Domestic Violence Action Center of Hawaiʻi spoke to participants about the importance of this issue. According to national statistics, 1 in 3 women and 1 in 4 men have been victims of some form of physical violence by an intimate partner within their lifetimes. “Violence affects everyone and I hope that bringing awareness to these facts will help people take action. Let’s continue to take care of one another in the spirit of aloha,” said Beeman. The PSA will begin airing on August 15, 2016, and will also be shown in UH venues such as the Stan Sheriff Center, Les Murakami Stadium, Wahine Softball Stadium and Aloha Stadium. The PSA will also be used for Title IX educational programs at the university and in the community. Additionally, the PSA will run on local radio stations.